This chocolate shortbread was a regular favourite in our house growing up. We used to do a lot of baking. My first experience of cooking was helping my grandmothers and my Mum with cakes or biscuits. I remember Nanna Eileen’s perfect Victoria sponges (she made two every week so she had a lot of practice! ), Nanna Connie’s melting moments and Mum’s coconut tarts, chocolate cakes, cherry cakes and chocolate shortbread. I hadn’t had chocolate shortbread for many, many years and then on a visit to my Mum’s I had a search through her recipes. 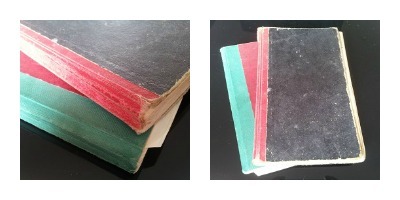 I found these two little hardback books full of recipes. They’re a little bit stained and worn but you can see just how well-used and well-loved they’ve been. 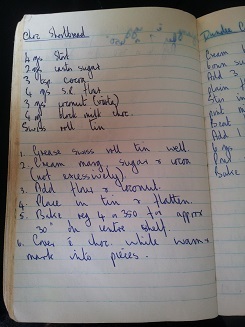 And in one of them I found the old chocolate shortbread recipe. I don’t do a lot of baking nowadays, mainly because it’s so hard not to eat too much of it when I do! 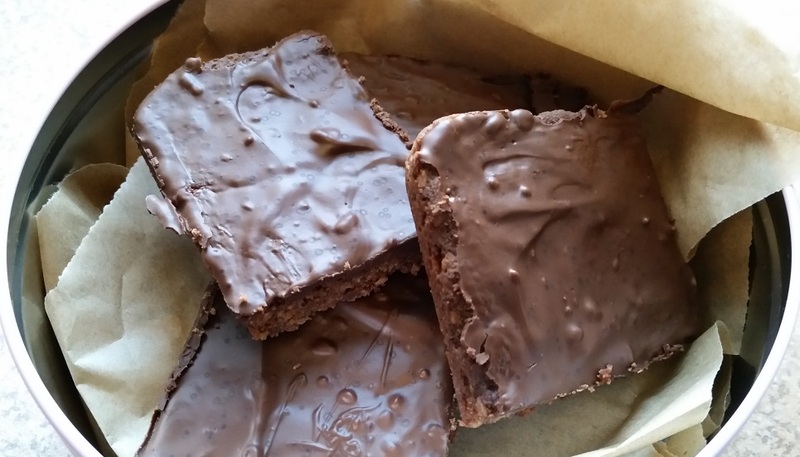 And this recipe is no exception – it has a really moreish texture which makes it very hard to eat just one piece. I have recently joined the local Seven Hills Women’s Institute where cakes are very welcome so I’m planning on using that as an excuse to do a bit more baking in the future. I think because it’s such a part of my childhood I find it a very comforting thing to do. The shortbread in the name is a bit of a misnomer here because the coconut in the recipe means it isn’t particularly shortbread-like. But it is beautifully rich and crumbly and really easy to make. You can cover it with milk or plain chocolate depending on your preference. Preheat oven to 180 °C/gas mark 4. Grease a swiss roll tin (approximately 16cm x 26cm). Cream margarine or butter, sugar and cocoa together. Add flour and coconut and mix to combine (it makes quite a stiff mixture). Put mixture into tin and press flat. Bake for 25-30 minutes on a middle shelf. Melt chocolate and spread over shortbread. Cut into 12 pieces while still warm.